I went blackberry picking in Warwick Gardens this morning. The bushes hang over the fence from one of the gardens and are laden with ripe, succulent fruit. I stewed some in red wine with star anise, cinnamon and a squirt of honey (yum!) and packed the rest away in the freezer for later. 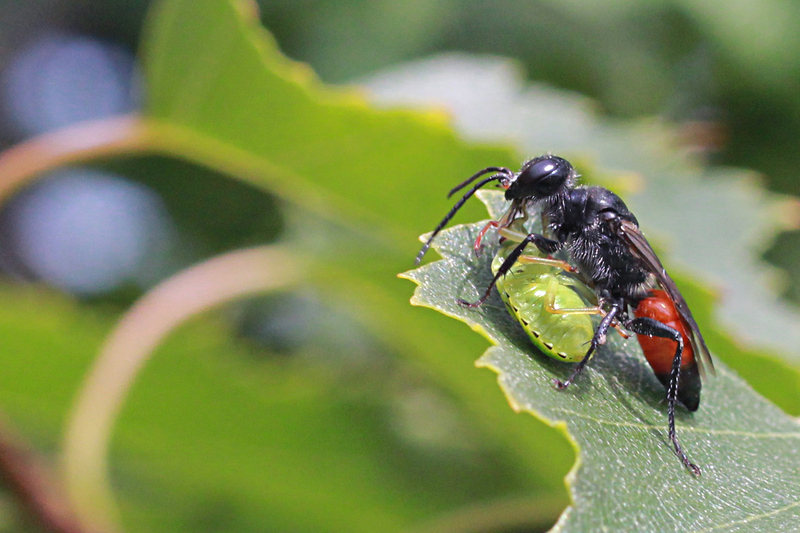 Another creature stocking up her larder was Astata boops, a fine-looking shield bug-hunting wasp. She looked rather happy to have caught a Birch shield bug nymph and was running up and down the birch tree working out a way to carry it back to her nest. These wasps make their nests by burrowing into the ground and building cells. The tunnel can be 10cm long and usually contains two or three cells. Our wasp has her nest near one of the blackberry bushes as she flew off the tree and disappeared into a hole under the grass. The female fills each cell with a shield bug, lays her egg in it and seals up the cell. The entrance to the nest is also sealed and guarded by the male. The larvae feed on the shield bugs over winter and emerge as adult wasps in the spring. This entry was posted in Insectinside, Peckham, Penny Metal, Urban wildlife, Warwick Gardens and tagged Astata boops, Birch shield bug nymph, Insectinside, Peckham, Shield bug hunting wasp, Warwick Gardens, Wasp by insectinside. Bookmark the permalink.